It’s Speedy Tuesday! This week’s Speedmaster for our Speedy Tuesday is a bit of a strange duck in the bite, but has quite an interesting story to it. In 1973, Omega celebrated their 125th anniversary by introducing a limited edition Speedmaster 125 for this occasion. The Speedmaster 125 was the first automatic chronograph watch that was chronometer certified. The Lemania based caliber 1041 movement has only been used in this Speedmaster 125 watch and was based on the more common caliber 1040 movement. Enough for the tech-talk. 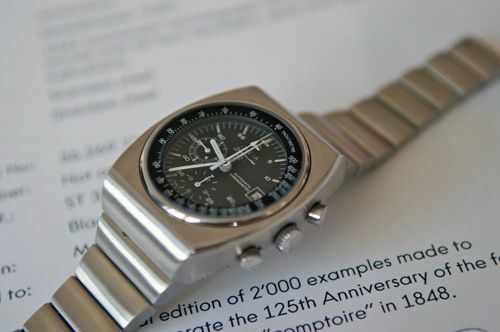 As you can see on Omega’s ‘Extract of the Archives’ document pictured above, Omega limited the production of this Speedmaster 125 to 2000 pieces only. You might think that these watches must be hard to get in the meanwhile, but that’s a bit disappointing (for the owners) till now. If you search on the Speedmaster 125 on Chrono24 for example, you will notice that there are at least a dozen of them for sale. Try a search on a limited edition Speedmaster Professional ‘Snoopy’ for example, and you’ll find one or two, while Omega has produced 5,441 of them. My wildest guess is that this is due to the size (dimensions) and weight of this Speedmaster 125. As Chuck Maddox documented in his excellent Speedmaster 125 article (Proud Testimony to 125 years of watchmaking), the width of the watch is 42mm and the length is a whopping 51mm. The 42mm is an average diameter these days but the weight of 182.9 grams definitely is not. It is a heavy watch but very wearable. The Speedy 125 has a modular construction, where you can remove the inner part of the watch from the case. It is a bit unclear to me why you should do this, except for having a smaller ‘stopwatch’ than you can hold in your hand while timing something. If you are looking for a Speedmaster 125 like this, pay attention to the bracelet (some of these models came with a ref.1225 replacement bracelet after a service overhaul). It should be 1221/212 model, which is a lot thicker than its ‘service’ successor. The first link of the 1225 bracelet is almost half a CM thick! Furthermore, make sure that the gaskets are clean (the ones between the outer case and the inner case) and that the movement runs smoothly of course. More on Omega’s ‘Exctract of the Archives’ can be found here. For CHF 75.- you will receive a nice folder with a document as pictured above. Although very useful, I think Omega has made a mistake in these documents regarding the Production date. As you can see, the production date was on the 25th of March, 1975. I am convinced that they mixed up the production date and the shipping date. It is more logical that this watch has been shipped to Germany on the 25th of March 1975 that it was produced in that year (while it was a 1973 timepiece with only a limited run). In the past, when John Diethelm was curator of the museum, I asked him once about a Speedmaster Professional pre-Moon. He wrote me that it was produced in 1967 and shipped to Norway in 1968 (including an exact date). 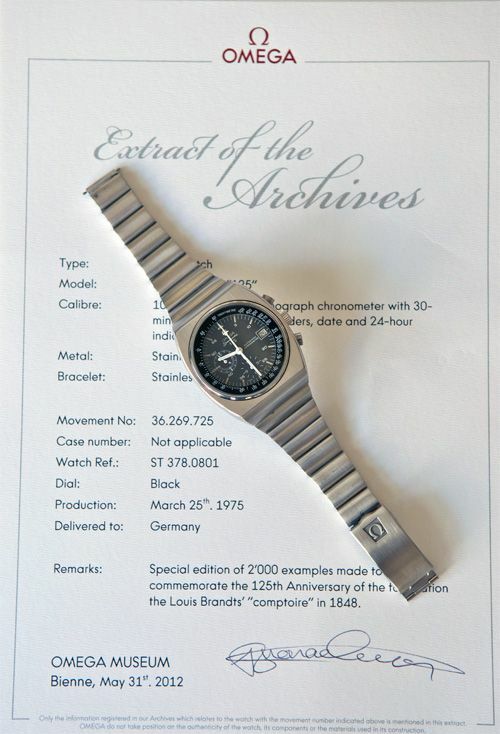 Years later, I retrieved an official Extract of the Archives from Omega stating that this watch was produced in 1968. Anyway, it is a great service and adds some value to your vintage Omega timepiece. Most of the time, documentation is missing with these vintage timepieces and this way you can at least get some information on your timepiece.